"Minuet in G" is found in a notebook Bach gifted to his second wife, Anna Magdalena. Originally thought to be an original composition by Bach, it has, since 1970, been discovered to be the work of Christian Petzold. On the 27th of November 2016, 5.5km of roads in Singapore were closed to create a pedestrian-friendly precinct for a fun-filled Car-Free Sunday, an event usually held on the last Sunday of each month. Pianos which are usually placed at The URA Centre’s Piano Park were moved by Play It Forward Singapore to Chong Wen Ge (崇文阁) on Telok Ayer Street. We appreciate all the kind donations and contributions that have been made by the Pianovers at our previous meetings. We would like to say a big thank you! Special mention must also be made for the kind and generous Pianover who donated two Mistral 8" turbine fans, and two white extension cables for the connection to the existing portable generator. These electric fans provided much-needed relief from the stale tropical heat. In Singapore, the pursuit and enjoyment of piano has to compete with a rigorous education system that is based primarily on examination grades. As a result, parents who heretofore may have been encouraging their children in their piano studies, often cancel piano lessons during exam periods to allow their children more time to study. The Pianovers returned to The URA Centre again this week for the 16th Pianovers Meetup. After the meeting last Saturday at Orchard Central, it was back to the heart of the city, with the bustling of weekend excitement. Many new faces showed up to the meeting this week, faces like Anthony MB, who had been in engagement with us on ThePiano.SG Facebook Page, Samuel and his friends, Lian Ong and Geoff Tan, Xuanying, who was invited by Junn, as well as Alicia and Junhao. Some consider pianicas to be superior to long-established woodwind instruments. While instruments such as the flute, saxophone or clarinet tax the performer because of the need for multiple fingers to cover certain holes to generate just one sound, pianicas allow the freedom of sounding one note with merely one finger, along with the liberty of pressing other keys with other fingers, like in playing a chord. At last Friday's meeting, the group was taken to a new location away from the bustling city traffic and the sweltering island heat, at the air-conditioned 10 Square @ Orchard Central. Tucked away in a cosy room, the 15th Pianovers Meetup still managed to draw an immense crowd. From time to time, little surprises present themselves in the course of our work or lives. This certainly rang true for us here at ThePiano.SG last week, when we came face to face with someone we had previously featured on this portal. The Pianovers Meetups see piano teachers, students and performers alike join in on Sunday for a chance to showcase their talents in front of a small crowd and gain confidence. Going forward, Pianovers Meetups could potentially be a great platform for members of piano clubs, young and old alike, to practise their pieces ahead of a concert! Are You Allowed To Sing "Happy Birthday"? It is the most identifiable song in English according to the 1998 Guinness World Records, but the history of "Happy Birthday to You" is surprisingly rancorous and filled with lawsuits. You might have heard it hundreds of time, but what you might not know is the copyright status of the song remained cloudy and in contention for a very long time. The phrase “There’s no place like home” has certainly rung true for our Pianovers this week, being back at the familiar URA Centre after the first indoor meeting held by the gracious Goh Zensen at his home last week. With all the friendships and bonds that have been formed and continue to be formed through the meetings, the Pianovers Meetup has become more like a gathering of kith and kin to some of us. “I only want my kids to learn piano playing. Can we just leave out music theory homework and music theory lessons?” These were the words from my students’ parents when I was a part time piano teacher. Despite my firm belief on the importance of music theory training, they did not support instruction in music theory. This article therefore explains the importance of music theory lessons. ThePiano.SG never fails to bring the piano community together in novel ways and to savour interesting experiences, and so it was with great excitement that the portal organises the first piano-themed yacht outing for Pianovers in Singapore - Pianovers Sailaway! Every Sunday for 11 weeks in a row, the Pianovers Meetups have been held at the URA Centre, where 2 donated pianos by the Play it Forward movement currently sit. Pianovers would gather for a hearty dinner at Maxwell, and head over to the Centre for a night of music and laughter. Things were a little different coming into our 12th meetup, as Goh Zensen graciously opened up his home to host the first ever indoor Pianover Meetup! What Do Opus Numbers Really Mean? Like any important body of knowledge, music needs to be organised, archived and categorised for easy reference. While subjects in an encyclopaedia are organised in alphabetical order, works of music are arranged in numerical order. However, the process of numerical ordering has undergone several changes over the years, with certain imperfections and areas of complication smoothed out. Steinway & Sons is proud to introduce the Crown Jewels series of grand and upright pianos, alongside internationally renowned in-house brands, the Boston and Essex lines. The model to be launched is the Indian Apple K-132 upright piano. This unveiling ceremony was supported by AXA Insurance and was the platform for said company to introduce its Art Insurance policy. AXA Art’s collaboration with Steinway Gallery provides owners with an all risks insurance protection for their prized pianos. Last Sunday’s Pianovers Meetup was one of the most exciting meetings we’ve had to date. With a sizable turnout of about 30 people, it was the largest attendance the group had ever seen. Pianovers from all walks of life gathered for an evening under the roof of The URA Centre, laughing, singing and clapping along to another unforgettable night of wonderful music. A talent from Singapore has joined the exalted ranks of Steinway's elite musicians. Mervyn Lee from Singapore, just 18 years old, is now officially a Young Steinway Artist. Mervyn will now join the prestigious list of artists on the Steinway & Sons Roster and in addition, enjoy access to the worldwide resources of Steinway & Sons and its exclusive network of dealers. The Pianovers Meetup never fails to bring piano enthusiasts that share a common and undeniable love for music and piano playing together under the same sky. Over the past nine weeks, many friendships have been established and the meetup has been one success after another. The scenario is a familiar one. You buy a piano, fall in love with it, and start working with it, spending hours and hours in blissful symbiosis and melody-making when suddenly, horrors! You discover that a piano key is stuck and does not bounce back after you strike it. What happened? What can be done about it? There was no mistaking the casual mood this evening. Even the group photo portrayed a more informal pose! We had a very interesting canine visitor, Pachu. To a picture of the adorable brown dog with its paws placed on the keyboard, Jiahui exclaimed, “Some pawsitively cute photo if you've had a ruff day!" The weekly Pianovers Meetups started in July as a platform for piano lovers to meet, play and network. Every Sunday evening, without fail, a team of Pianovers (piano lovers) converges at the URA Centre, at the spot where two refurbished pianos have been left as part of the Play It Forward, Singapore’s initiative to place pianos around Singapore for the public’s enjoyment. Not only do regular faces attend every weekend, new faces visit too, if only out of curiosity. It is heartening to see the newcomers return the following weeks and become regulars themselves. The weekly Pianovers Meetup reconvened on Sunday, 11 September 2016. Since its inauguration in July, the weekly Pianovers Meetup has brought together a group of passionate music lovers. Regardless of their experience in piano-playing, people connected by a common love for the piano has been coming together to jam, to learn and to bond. And a first was achieved in this Meetup: Some attendees played their very own compositions! The piano - an instrument that is capable of producing melodies as soft as silk and as majestic as The Taj Mahal. It is not an inexpensive instrument, yet several pianos in the world now have price tags that would astonish the common folks. Though they may serve the same purpose, expensive pianos awe the public and showcase the grandiose lifestyle of the rich and famous. Contribute an Article related to piano, and get full credit for it. 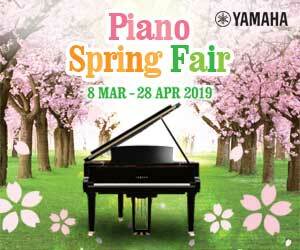 Please contact us at yongmeng@thepiano.sg to find out more.